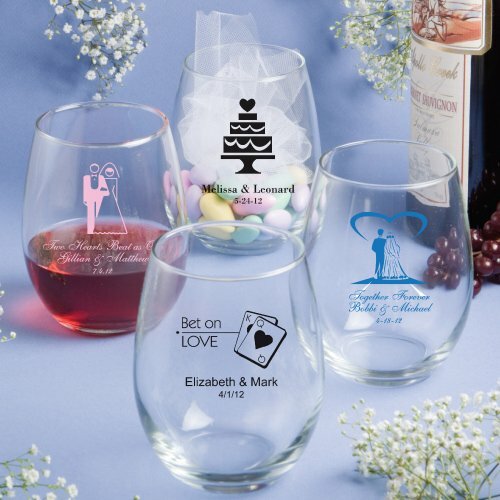 Raise a toast on your special day with our personalized 15-ounce stemless wine glasses wedding favors. You can choose a design and text specific to your event to have silk-screened onto these lovely glasses. They have all the elegance of the stemmed version without the risk of toppling over. A beautiful and sentimental choice, they are also a practical favor that guests can treasure when they take it home. Hello, I wanted to ask if this is screen print only? If so, is there any way to guarantee it won't fade or scratch off? 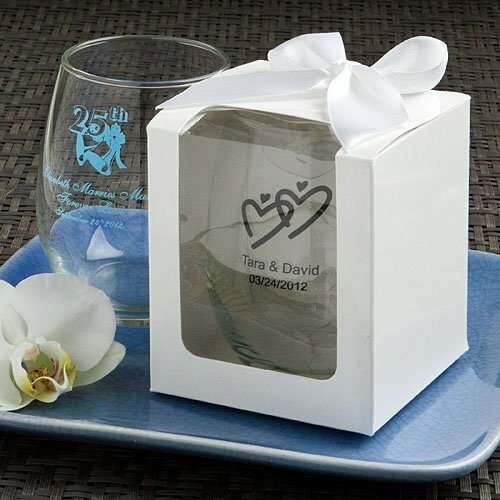 Yes, the Personalized Stemless Wine Glasses Wedding Favors (15 oz) are screen printed and will not fade right away. Hi! I am trying to order one sample and its $0.25. But itâs charging me $11 for shipping. That is not what I was told when I previously called. Please,clarify it and let me know how I can order just one and not pay so much for shipping. Thank you! Our shipping fee is an actual fedex/ups charge and we do have the lowest prices. To order a sample just enter 1 in the quantity box and complete the check out. Hello, is text font size editable? I'm sorry we are unable to adjust the font size of the Personalized Stemless Wine Glasses Wedding Favors (15 oz) but there will be other fonts that you can choose from our designer tool that would make the font bigger. Hi! So we have 13 girls in the bachelorette party. Is there anyway I can write the girls name on each individual glass? Hi. I am looking at the personalized stemless wine glasses. There is an option to get gift boxes. My question is, how are they glasses shipped? Are they shipped in their own boxes or all in one box, separated by cardboard or something? The Personalized Stemless Wine Glasses Wedding Favors (15 oz) are packed in bulk. If you add a gift box, it will arrive flat so you need to manually assemble it into the box shape.